The Khmer Rouge Tribunal, formally known as The Extraordinary Chambers in the Courts of Cambodia (ECCC) in 2005 before it started its operation. This building was built as a Theater Hall for the Cambodian Military Headquarters. This hall later became the court gallery of the ECCC, where hearings took place. 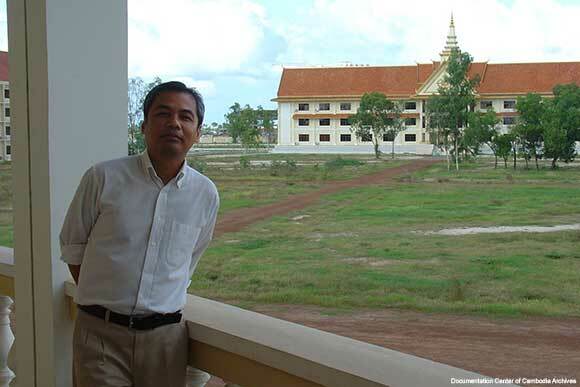 Youk Chhang, Director of the Documentation Center of Cambodia with legal associates at the Extraordinary Chambers in the Courts of Cambodia (ECCC) in 2005. Source: Documentation Center of Cambodia Archives. Additional materials and sources of information on the tribunal can be found by using our site’s search engine (particularly for articles in our monthly magazine, Searching for the Truth), the Cambodian Government website for the The Khmer Rouge Tribunal Task Force and The ECCC website.